Archaeologists have uncovered a Native American burial site dating back 7,000 years off the coast of Florida. The site was found by an amateur diver in 2016 who was looking for shark teeth but stumbled on an ancient jawbone. In a picture sent from the diver, archaeologist Ryan Duggins noticed a worn down molar tooth attached to the jawbone. This suggested it belonged to a prehistoric person. Florida state officials called the find an “unprecedented discovery”. Mr Duggins and his team began investigating the site from the “Archaic Period” located 900ft (275m) from shore. The burial grounds are expected to cover about 32,000 sq feet (3,000 sq metres) off the coast of Manasota Key. 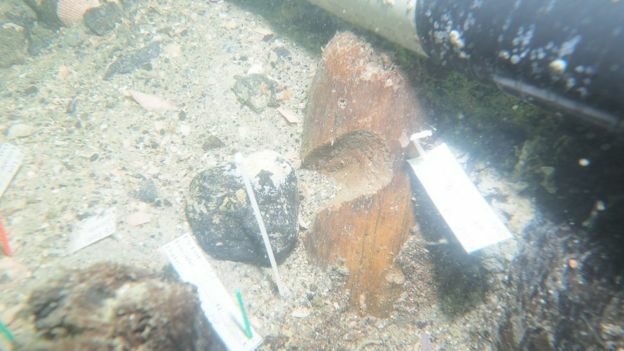 Underwater, the team found densely packed organic remains, human bones, and sharpened wooden stakes and textile fragments, according to National Geographic. “Seeing a 7,000-year-old site that is so well preserved in the Gulf of Mexico is awe inspiring,” Mr Duggins said in a press release from the Florida Department of State. The site is believed to have been preserved in a freshwater pond thousands of years ago when water levels were 30ft (9m) lower, according the a press release.. The pond had a bottom covered in peat, which reportedly slowed the process of organic decay and allowed for the preservation of human remains. “Our hope is that this discovery leads to more knowledge and a greater understanding of Florida’s early peoples,” said Florida Secretary of State Ken Detzner. The state said they are working closely with Native American tribes to ensure the proper treatment of the bones. “We are happy to be working, shoulder to shoulder, with the Bureau of Archaeological Research and the residents of Manasota Key to identify a preservation plan that will allow the ancestors to continue to rest peacefully and without human disturbance for the next 7,000 years”, the Seminole Tribe of Florida’s historic preservation officer Paul Backhouse told the Bradenton Herald newspaper. “The highest priority of all involved is to honour tribal beliefs and customs with respect to this ancestral resting place,” said the Florida Department of State. 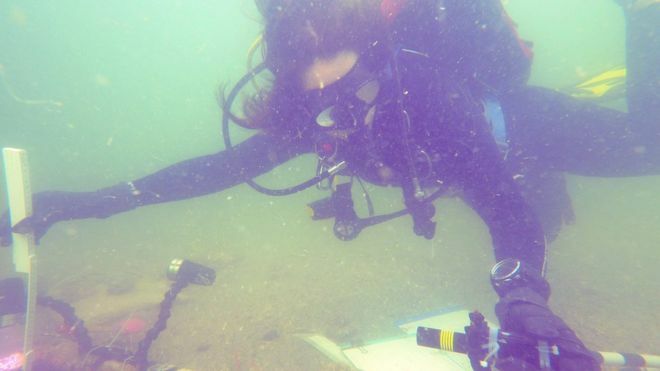 Florida archaeologists have discovered other evidence of the Archaic period but say this discovery is remarkable because the site survived offshore through hurricanes and erosion. “The vast majority of underwater archaeological projects have historically been focused on shipwrecks,” Mr Duggins told National Geographic. This entry was posted in History, Science, Travel, USA, World and tagged Florida, historic preservation, History, PICTURES, Science, tourists, USA by rolyred. Bookmark the permalink.